Quantitative Value is a term for quantitative stock investing strategies which select the highest-quality stocks out of a bucket of cheap stocks. 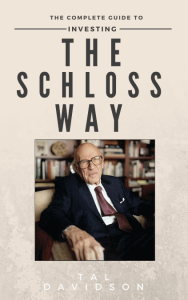 Dr. Wes Gray and Tobias Carlisle were the first to design such a strategy, which they introduced in their book Quantitative Value. 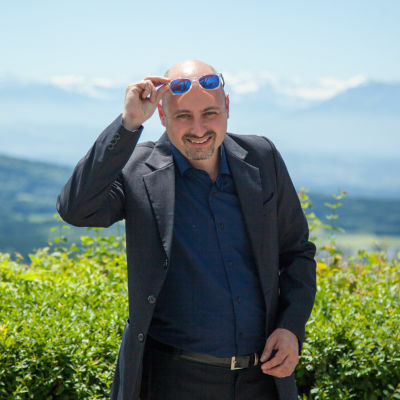 While sharing the same principles, the implementations of various Quantitative Value (QV) strategies differ in the selections of the universe of stocks to choose from; in their cheapness filters; and in the Quality ranking system. I have implemented my own version of a Quantitative Value model, defining a proprietary set of universe selection rules, cheapness filter threshold, and Quality ranking system. I have designed a stock screener based on my Quantitative Value model, allowing the adjustments to market cap and cheapness filter threshold. The stock screener is available to members of the Quant Investing community on my website. In this article, I shall review the results of my QV strategy implementation during the first three quarters of 2018. A word of caution should be made before diving into the results. Three quarters are too short of a term to be able to draw any meaningful conclusions on the merits of a fundamental quantitative strategy. Value investing is a long-term venture. Only after several years can one depict if a value investing system is of any value. Therefore, the results herein are brought as merely pieces of anecdotal evidence. 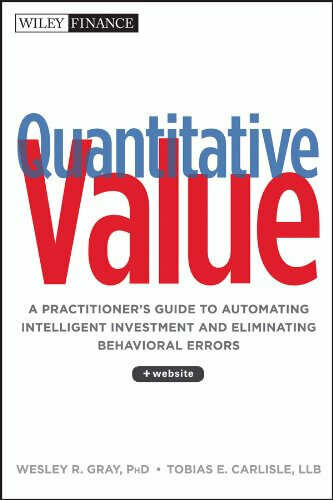 To further learn about the long-term performance of the Quantitative Value model, the reader is referred to my backtesting report spanning 18 years. Following is the performance of the Quantitative Value performance using various screener configurations. The first chart presents the performance of 30 QV stocks, with a market cap of the 30% percentile or larger. The smallest stock in this sample is BG Staffing Inc (BGSF), with $139M market cap, and the largest is Amgen (AMGN) with $126B market cap. 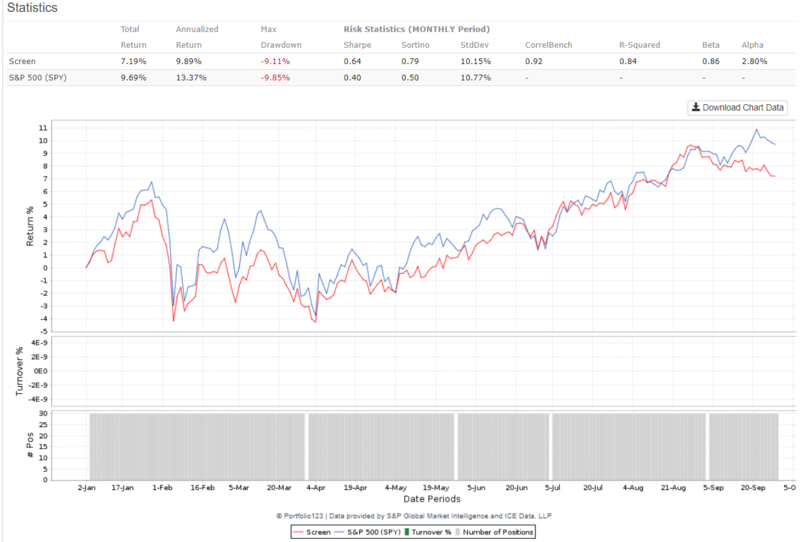 The QV Screener resulted in 8.02% for the year, vs. the S&P 500 with 9.69%. Both figures are inclusive of dividends. While the results are somewhat similar (within the typical volatility range), note that the standard deviation (StdDev) of the Quantitative Value Portfolio is lower than the S&P 500’s, at 9.64% vs. 10.77%. The max drawdown is also lower. What it means is that during 2018, a Quantitative Value portfolio was less volatile than the benchmark. Since the returns were pretty much similar, and since the volatility of the QV portfolio was lower – the risk-adjusted measure of Sharpe ratio is higher for the QV portfolio, 1x for QV vs. 0.4x for the benchmark. This is a surprisingly good result, given that the QV portfolio contains large caps as well as small caps. Small caps are more volatile than large caps as individual issues, but the group of high-quality cheap stocks, even containing small caps – is less volatile than the market benchmark. Holding this Quantitative portfolio would provide its owner with peace of mind during 2018, no less and even more than holding the S&P 500. But what if we chose to hold only 20 of the highest conviction QV stocks during the same period. The next chart provides the answer. Holding 20 stocks with the same market cap limits resulted in 11.10% return, 1.41% more than the S&P 500. Still not materially different, if only slightly better. 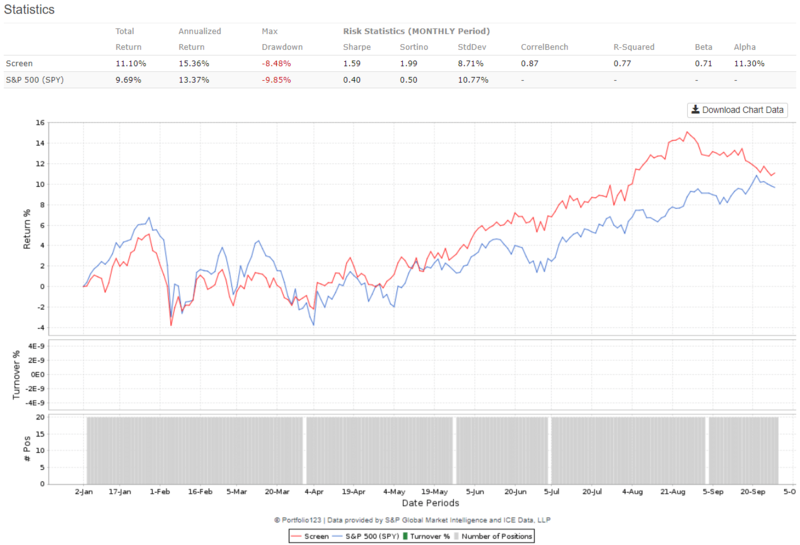 The volatility of the QV portfolio is lower in this case as well, with a Sharpe ratio of 1.59x, a materially higher figure than 0.4x for the S&P. As expected, as we increase our market cap limits, our results benefit less from the cheapness and quality factors. The QV portfolio came in with a return of 7.19%, vs. 9.69% for the S&P 500. How do these number fares against the performance of the original Quantitative Value strategy introduced by Carlisle and Gray? Let’s examine Alpha Architect’s US Quantitative Val ETF (QVAL). It is an ETF managed by Dr. Wes Gray himself (along with Dr. Jack Vogel). The ETF is comprised of 40 Quantitative Value stocks of a market cap above the 60% percentile (about $2B and up). It is expected to have the closest resemblance to the QV strategy described in Carlisle and Gray’s book. Based on Yahoo! Finance, QVAL achieved only 0.98% during the first three quarters of 2018. 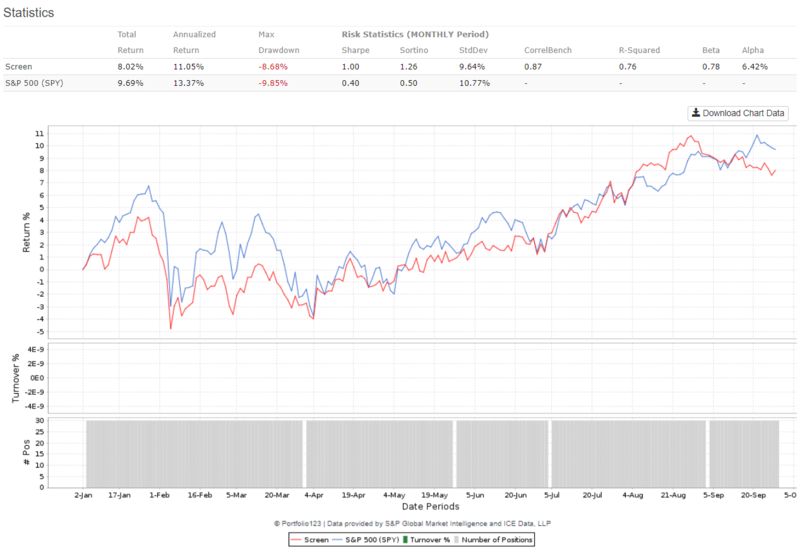 Compare that with 9.69% for the S&P 500 and 8%-11% returns of our small-cap QV implementation. The results DO NOT mean that our implementation is better or worse than Alph Architect’s. It only means that they are different. First, as indicated above, a comparison spanning only three quarters is not meaningful. It can be regarded as anecdotal evidence at best, brought mainly for entertainment purposes. Secondly, we are not comparing apples to apples – the no. of holdings is different, the market cap limits are different, and management fees are different (our screener does not have any). Had we chosen 40 stocks with the same market cap limitation, we would have resulted in 6.88% returns. 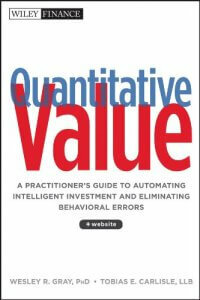 Quantitative Value is a sophisticated quant strategy that has been shown to outperform the market over the long term. During the first three quarters of 2018, our implementation of Quantitative Value resulted in 8%-11% returns, in par with the S&P 500 returns during the same period. However, although our QV portfolio included small caps, its volatility and drawdowns were lower than the benchmark. Two concluding remarks are warranted. First, Dr. Wes Gray and Dr. Jack Vogel of Alpha Architect are among the greatest quantitative investors and thought leaders of our time, in the area of quantitative investing. 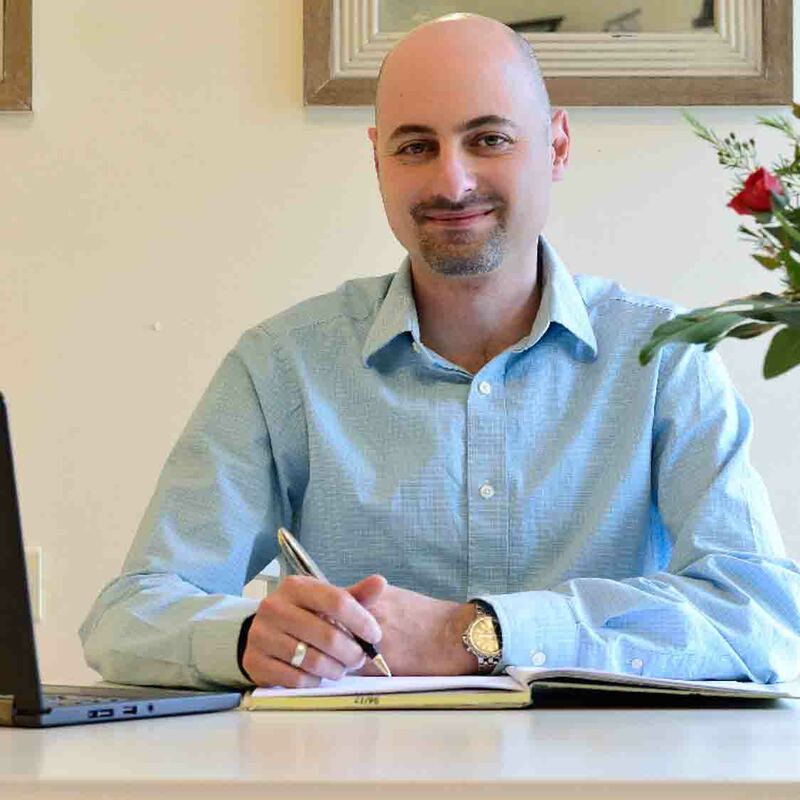 We regard them as gurus and read their insights voraciously on the Alpha Architect Blog. 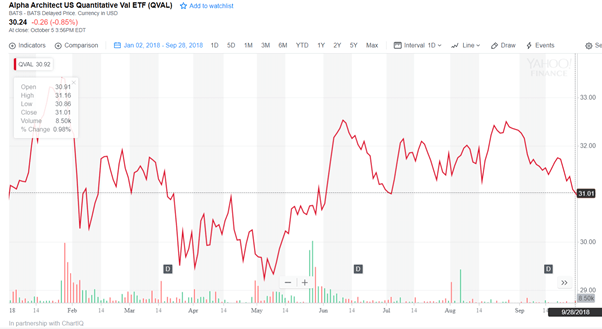 Secondly, the performance of QVAL has been better than both our QV model and the S&P 500 for several months-long periods, over the past several years. Their backtesting results are astonishing, beating both the S&P 500, The magic formula and other prominent active funds by a wide margin, over many decades. For do-it-for-me investors, we recommend investing in QVAL wholeheartedly. For do-it-yourself investors, a quantitative value screener allowing customization and avoidance of management fees – may be a compelling option. My QV stock screener is available to members of the Quant Investing community at TalDavidson.com.